The true greatness of a person is measured by the impact that person has on the lives of others. This statement rings true for the Minister of Health Dr Mantombazana Edmie Tshabalala-Msimang who has touched the lives of many in different ways. In a country marked by a high burden of diseases, inequality and abject poverty, to succeed in improving access to quality health care requires nothing less than absolute devotion and loyalty to serve one’s country. Such is the profound devotion that the Minister of Health has shown. Born in Emfume south coast of Durban on the 9th of October 1940, the young Manto completed her high school education at Inanda Seminary School in 1959. In 1962, shortly after the African National Congress was banned, a young and eager Manto after completing her Bachelor of Arts degree at the University of Fort Hare was ordered with a group of 27 other spirited students to go into exile by the ANC leadership. She was in exile for 28 years. These students including Thabo Mbeki who fled the country under the guise of being members of a football team – had been identified as future leaders of South Africa who would one day return triumphantly to the country of their birth. They were arrested several times and thrown in jail before being flown into Tanganyika (now Tanzania), where the young Manto spent most of her years in exile. Prior to her departure, her mother had implored her: “to do something for me if I should never see you again – become a medical doctor”, the promise Dr Tshabalala-Msimang fulfilled under difficult conditions. She completed her medical studies, hopeful that one day she would return to her country. She graduated from the First Leningrad Medical Institute in the then U.S.S.R.
She spent time practicing medicine in various African countries – an experience that put her in touch with the real victims of poverty. This experience spurred her to further her education by gaining, amongst other qualifications, a Masters degree in Public Health from the University of Antwerpen in Belgium. She was also a Registrar in the Obstetrics and Gynaecology Section of the Muhimbili Hospital in Dar-Es-Salaam. Tanzania and as Medical Superintendent of the Lobatse Hospital in Botswana. She speaks Russian and Swahili. She is one of the founder members of the ANC Health Department, which was established in 1977 and convened the First International Conference on Health and Apartheid – under the auspices of the World Health Organisation in 1980. She has been blessed with a stable and supportive family life – married to Mr Mendi Msimang, former ANC Treasurer-General and former South African High Commissioner in London, and two daughters – Zuki and Pulane – and four grandchildren. On her return to South Africa in 1990, the Minister contributed towards the National Progressive Primary Health Care Network by assisting in developing policies on health and also serving on various committees promoting health and gender issues. Becoming a Member of Parliament following the historic elections of 1994, she chaired the Portfolio Committee on Health in the National Assembly. 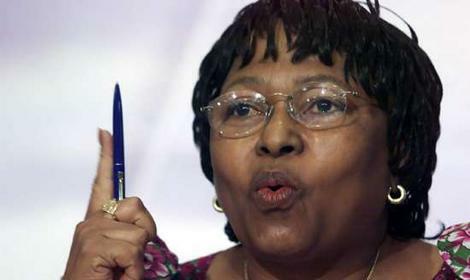 Her appointment as Deputy Minister of Justice followed in 1996. This is where she made her mark during her many fights for the rights of women and children in the criminal justice system.